But, I realize that cabbage is pretty much stigmatized around the world with the exception of Germany and Korea. 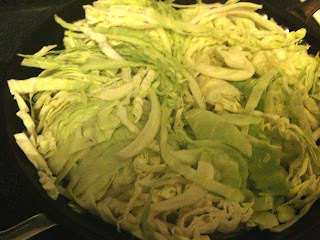 As I was perusing one of my gazillion cookbooks, I came across "beer braised cabbage." I read the author's note and was instantly intrigued. He has been on a quest for a way to enjoy cabbage, and have others enjoy it. Unfortunately, most folks are only familiar with watery, bland, hardly-even-green-anymore, stinky cabbage that has been boiled to death or stewed for hours. And it's true...that stinky cabbage stink can take days to exit your dwelling. So, this guy started experimenting and came up with this recipe. I made it tonight with grilled sirloins and steamed broccoli. I realize that's two cruciferous vegetables in one meal, but I had to ensure that the little one would eat at least one veg. Neil didn't say much, but he ate his cabbage and Vivi's. I loved it! It was crisp-tender, had great flavor from the braising liquid and was unlike any cabbage dish I've ever had. I'm thinking of using the leftovers for another meal: serving grilled brats, kielbasa, etc. on top of the braised cabbage. And to quote my 5-year old wunderkind, "I LUUUUVVVV bratwurst!" Melt butter in large skillet over med-hi heat. 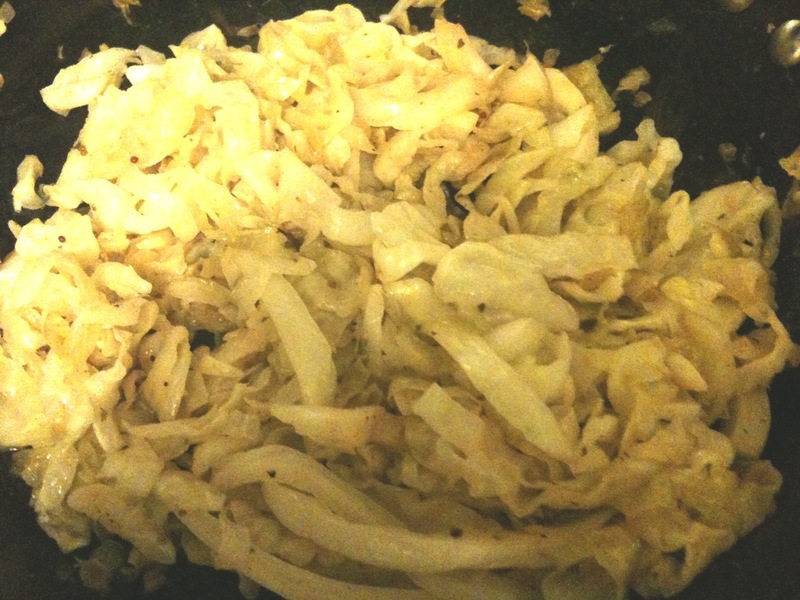 Cook onion until softened, about 5 minutes. Stir in beer, mustard and thyme and simmer until slightly thickened, about 2 min. Add cabbage and vinegar and cook covered, stirring occasionally, until wilted and tender, about 8 min. Season with salt & pepper and serve. "Mustardy, Beery, Yummy" = sounds great! !